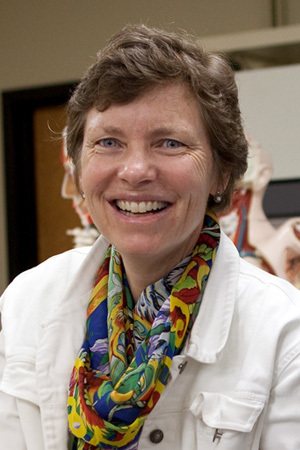 Biology professor Betsy Dobbins has been honored with the 2014 Howard College of Arts and Sciences Teaching Award. World Languages and Cultures professor Lynda Jentsch presented the award at a college faculty meeting Feb 4. Describing her colleague’s exceptional skill, Jentsch related the story of a student who recently asked for her help changing her major to Howard College from another university division. The move was prompted by the “human touch” of this year’s honoree. Dobbins impressed the student by sharing “her infectious enthusiasm and love for her discipline,” Jentsch said. Dobbins, who serves as Paul N. Propst Professor of Natural Sciences, teaches courses in embryology, neuroscience, bioinformatics, human physiology, foundations of biology. Intrigued by the interactions between science and the humanities, she also teaches scientific inquiry in the University Fellows honors program. Deeply committed to environmental health, Dobbins sponsors student research projects in Five Mile Creek and Shades Creek in the Birmingham area. She is the coordinator for Samford's Earth Day, a member of the Executive Board of the Cahaba River Society, secretary of the board of the Friends of Shades Creek, and a member of the Black Warrior Riverkeeper Advisory Council. Dobbins has earned several other awards at Samford, including the 2008 John H. Buchanan Award for Excellence in Classroom Teaching.